Originally posted as 25 Years Ago This Week in 2013. Updated in 2018. There we were, a full month after Christmas 1987 and the majority of the week's new entries on the Australian top 50 were songs that had been kicking around since early- to mid-December. 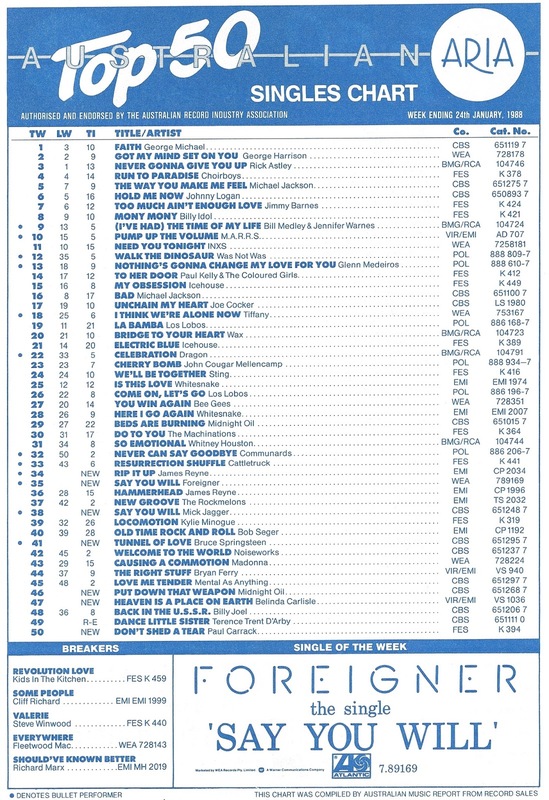 These days, most songs have a much quicker trajectory into the upper portion of the top 100, but it was normal in 1988 for a single to make a steady climb before bursting into the printed top 50. This week that year, there was one exception: a track which only made its top 100 debut in January, and, not surprisingly, would end up as the biggest hit out of this week's seven new entries. Speaking of big hits, Rick Astley finally surrendered his seven-week stranglehold of the number 1 position, making way for George Michael, who leapfrogged a patiently waiting George Harrison to spend a week at the top with "Faith". Continuing on from their collaboration on The Princess Bride soundtrack, this title track of the Mink DeVille frontman's official solo debut was produced by and featured guitar from Mark Knopfler. The first top 100 solo appearance for The Saints co-founder was taken from second album Rooms Of The Magnificent. Ed Kuepper wouldn't be back on the singles chart until 1994. A bit rockier than the synthpop stylings of "So Much For Love", but another great single for an under-rated Australian band and the title track of their third album. Following their Run-DMC collaboration, the Aerosmith renaissance was in full flight - in the US, at least - with this lead single from Permanent Vacation. Australia would get on board with the band's next album. After two top 50 hits from Blow Your Cool!, Hoodoo Gurus faced the inevitable drop-off with this stomping third single, which was about evangelical preachers. The problem with having a wildly successful (at least in Australia) cover version is that often your original material won't be as big - and so it was for Paul, who'd taken "When You Walk In The Room" into the top 10 in 1987, but lucked out with this follow-up, which I preferred. In the States, it was quite a different story, with "Don't Shed A Tear" (which charted first there) reaching number 9 while "When You Walk..." struggled to number 90. In his home of the UK, neither were hits. It had been released in the US back in September 1987, and, finally, Australia got in on the act with this slice of pop perfection, which would zoom all the way up to number 2, before spending many weeks stuck at numbers 2 and 3 behind "(I've Had) The Time Of My Life" and "I Should Be So Lucky". Although her debut solo album, Belinda, had only resulted in one hit, 1986's "Mad About You", this was the first of a trio of big worldwide singles. Australia pretty much lost interest after "Heaven Is A Place On Earth", however, and it wasn't until the Runaway Horses album in 1989-1990 that the Go-Go's frontwoman maintained a more consistent strike rate. "Beds Are Burning" had been Midnight Oil's biggest single - both locally and around the world - so following it up was always going to be tough. Add to that the fact Oils fans had already snapped up the LP, Diesel And Dust, sending it to number 1 and keeping Michael Jackson's Bad from the top, and it's little surprise "Put Down That Weapon" peaked where it did. I haven't listened to it in years and actually quite like the verses, but the song loses me in the chorus, especially the way Peter Garrett sings the song's title. The second single and title track from the Boss' 1987 album peaked at this very position, a big drop from the number 17 peak of "Brilliant Disguise". The performance of both songs fell somewhat short of that achieved by the singles from his previous studio album, Born In The USA, which included Australia's biggest single of 1984, "Dancing In The Dark" (a track which, interestingly, never got higher than number 5). I don't know if it's just because I'm a lot older now, but I don't dislike this song as much as I would have back in 1988. Three places higher than Mick was a US band who'd struck platinum on their previous album with globe-conquering power-ballad "I Want To Know What Love Is". "Say You Will" was the lead single from Inside Information, which also followed singer Lou Gramm's first successful foray into a solo career (see, striking while the iron was hot!) with "Midnight Blue". 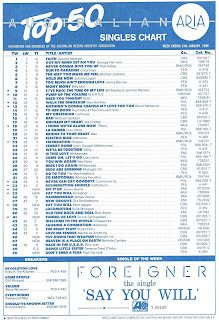 Foreigner's "Say You Will" performed much better than Mick Jagger's, hitting the top 10 in Australia. I've always been quite partial to a bit of Foreigner and this was one of my favourites of the time as well. Here's another former frontman for a rock band who launched a solo career a lot closer to his group's period of greatest success. And, up until this point, James Reyne had been rewarded with two big singles: "Fall Of Rome" and "Hammerhead". With "Rip It Up" making the highest debut of the week, things looked promising, but this was actually as high as the song got and by the end of February, it had disappeared from the top 50. "Rip It Up" is another song I haven't listened to in years - in fact, I completely forgot it existed. I can see why it faltered, since it's nowhere near as good as James's previous hits. Fourth single "Heaven On A Stick" might well have been a better choice - but by the time that came out, it couldn't even crack the top 50. It wasn't over for the ex-Australian Crawl singer, however. He'd return later in the year with one of his biggest solo hits, "Motor's Too Fast". Next week, there's only a handful of new entries so I'll also flip the chart over and take a look at what was happening on the albums side of things. Before that: the conclusion to my 1990 countdown. I was randomly thinking the other day that 'Dude (Looks Like a Lady)' is not a very politically-correct song title, and probably wouldn't work today. The title is somewhat ironic, given Steven Tyler himself looks a bit androgynous in the video. The Paul Carrack track was another not-yet-hit included on the 'Celebrate '88' compilation. Though I seemed to know it already when my sister bought it in late '87. Belinda was really at her peak, both song and looks-wise, with 'Heaven Is a Place On Earth'. There's an amusing (or so I think) interview she did with David Letterman to promote it where he can barely contain his lust for her - https://www.youtube.com/watch?v=ieK0ScoPXo4 - starting from just after 2 minutes in. If I remember correctly, she (or the song's writers, more probably) was sued by Bon Jovi over this song, with them claiming it plagiarised 'You Give Love a Bad Name'. There is definitely some similarity in the chorus, but I wouldn't say it was blatant. 'Put Down That Weapon' would be one of my favourite Midnight Oil songs... other than the middle 8, which I find jarring. Peter does look rather Freddy Krueger-esque in the video, to my eyes. I couldn't recall how the Mick Jagger song went either until it cropped up on a VHS I got several years back. I wonder how many people (more likely) bought this when they actually wanted the Foreigner version? Though Mick sounds nothing like them. Oops, I had thought Lou Gramm/Foreigner were English all these years. It's odd they don't appear in the video (that I can see, anyway) - because they were deemed too old/not hot?